Note: This instrument is not for sale. I am looking for a second, similar one, though. 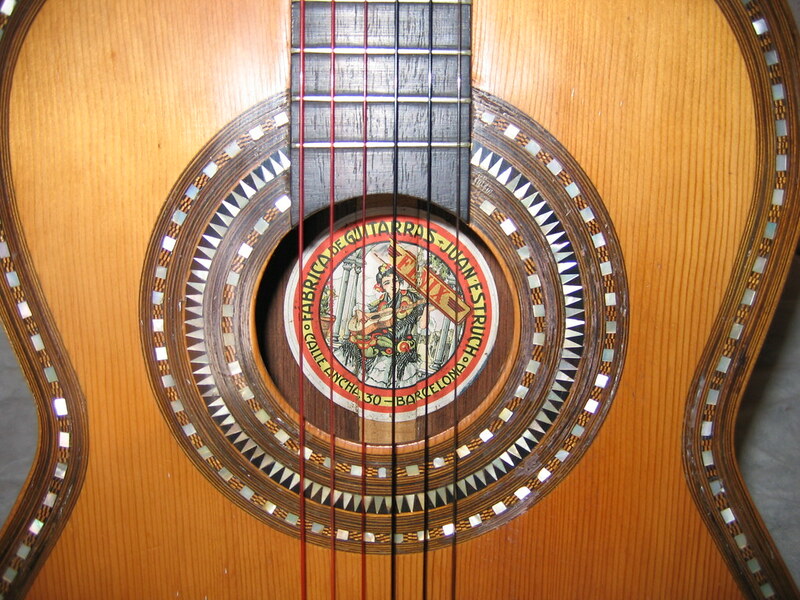 If you want to offer one, or just want an exchange about small vintage 1/8-sized Estruch parlor guitars, please use the comments below. 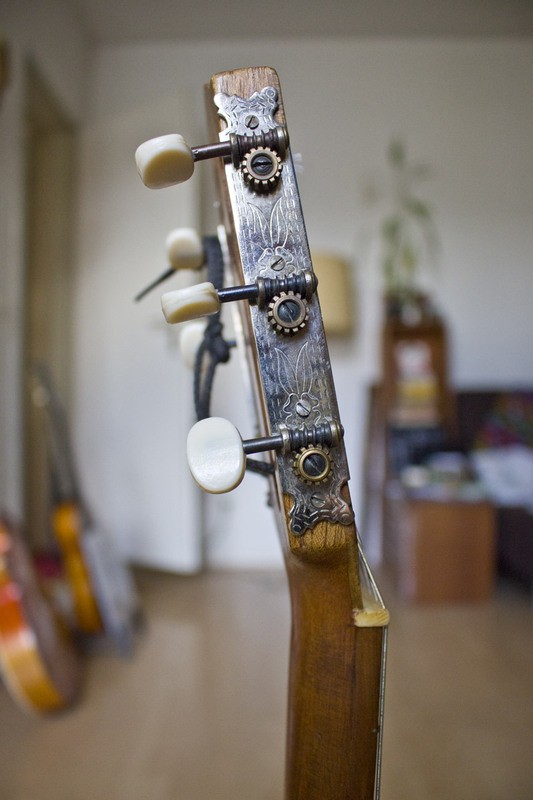 I found this beauty (see below) in summer 2013 in Gracia, Barcelona in the backroom of Guitarland SCP, hidden behind a line of average modern classical and Flamenco guitars. It must have been waiting for someone to look behind the front of shiny new instruments. I instantly fell in love with this thing, and the owner, who wasn’t very proud of this instrument, gave it away to me almost for free. 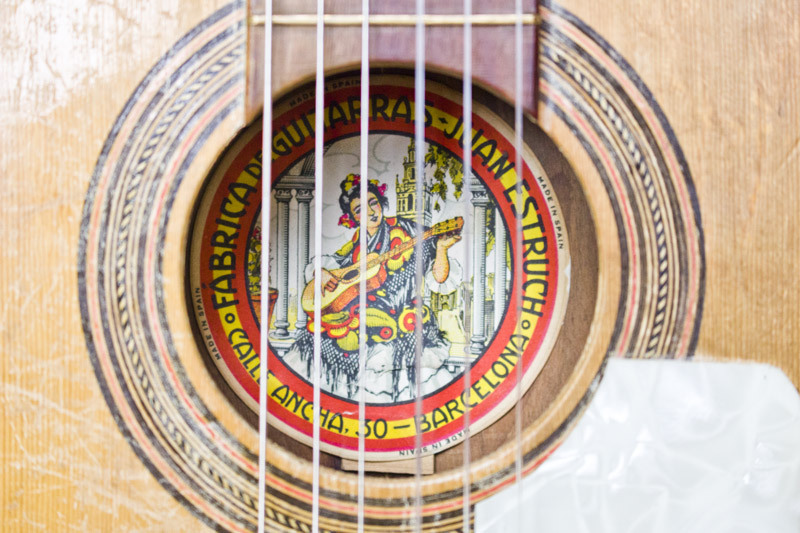 Later on i found out, that this tiny guitar was built by the Juan Estruch family, probably by Juan Estruch Pipo, the grandson of the founder Juan Estruch Rosell, who built guitars since 1880. I am not an expert in woods, so i can not say, which woods were used. 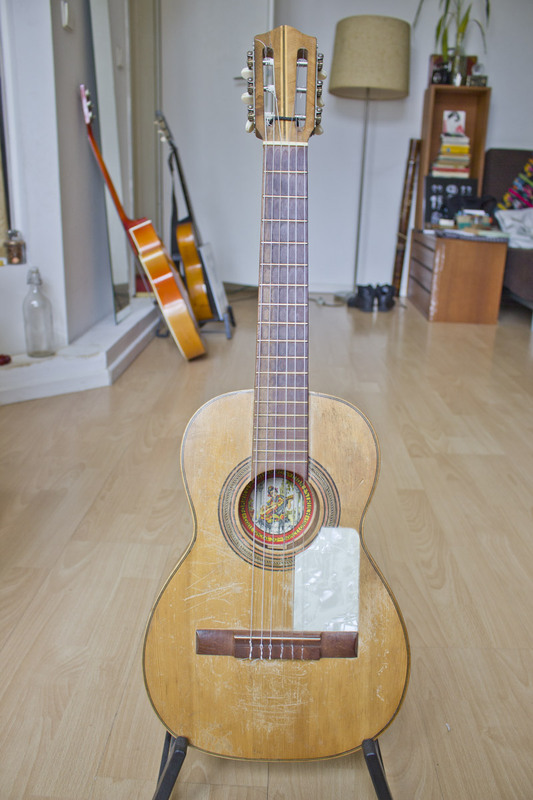 However, the guitar appears rocked down from decades of busking (including plastic scratchplate attached later i suppose), but is yet very sturdy and nicely playable. It seems to have been made for Flamenco-type of music. It hasn’t much bass due to its size, but is very loud with a rather low string height and responds super well to finger expression. It’s been a constant companion to me on lots of travels and stages, for it’s special and charming character. 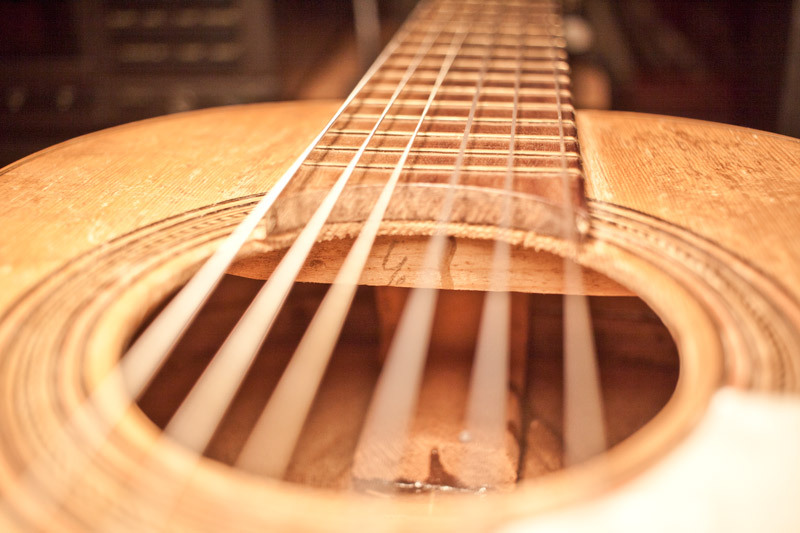 It has the bang of a flamenco guitar, it is loud, so you can entertain even a medium stage without amplification or microphones. At last it even fits into my tiny biking backpack, so you tend to take it anywhere, really, and due to it’s size and light weight it sits between your arms and hands without s strap nicely. As i am now looking for a second one of that type for my partner (who would love to just steal it from me) i got back into investigating, when this instrument was built and if it might have been part of a series. 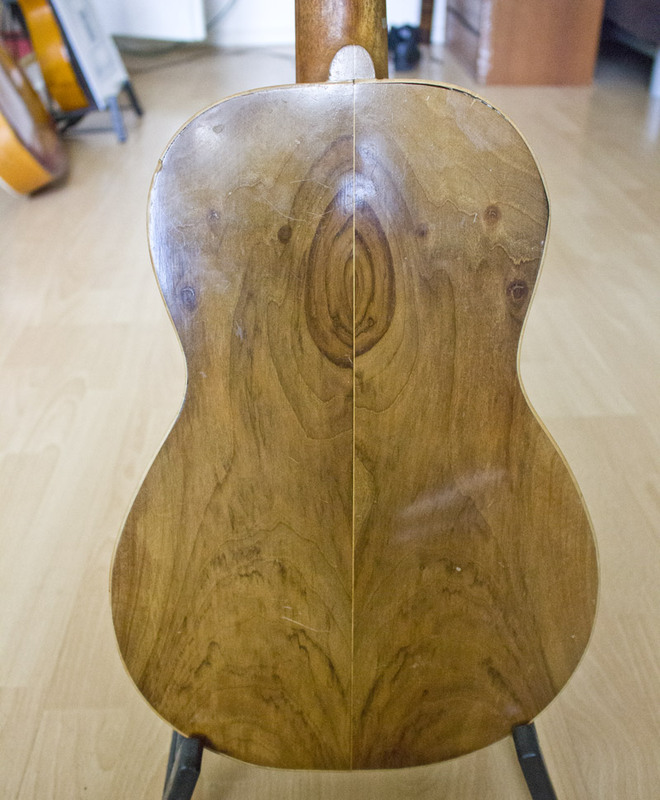 The label inside only seems to show up on the Dutch website Romantic and old guitars (scroll down for article). This informative article there indicates, that the model he is restoring and which carries the same label, was built in 1925. Another deceased advertisement for a sale of a similar guitar only left an image on the web, dating to 1940s-50s. This one shows a similar label, but without the “Made in Spain” tags, dating 1902-1922. 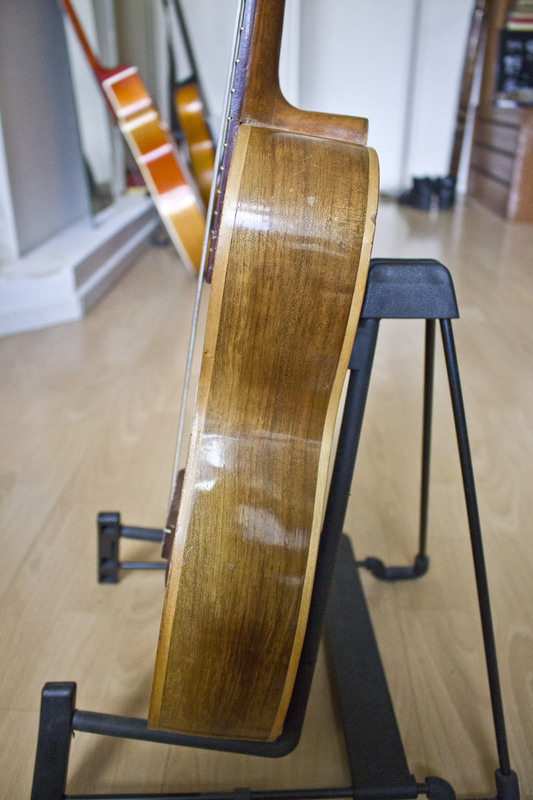 That sort of indicates, that my guitar might rather be post WW II. 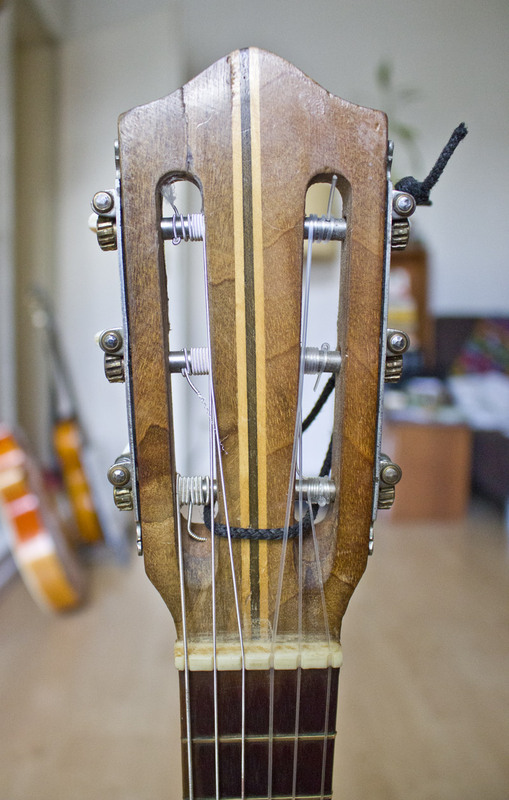 Juan Estruch luthiers website today (only flash, not much info). I am grateful for any hints regarding the age and availability of the model i have. The size seems to be 1/8 almost. Please use the comments below. And at last: Is that a penciled number, #4, or is it an initial, a “y.” ?? Again, if you should have more info on this instrument, or one alike: Please comment and/or get in touch. Hello!! 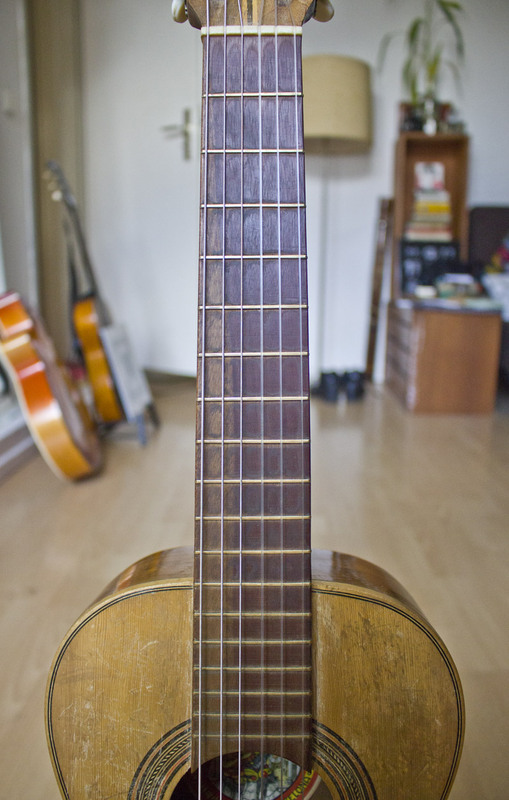 I have my Grandpa’s Juan Estruch guitar similar to yours. I have guitar #5 I wish I could send you a Pic of it.